If you have ever wondered how to smoke salmon, it is actually a fairly simple process that requires only a few basic ingredients and one key piece of equipment. When you smoke salmon the flavor of the fish is much different from when you broil or bake it in the oven. For this application the fresher your salmon is, the better your end product, so be certain to visit a respected fishmonger, or specialty fish shop and ask them for their freshest whole or side of salmon. Once the salmon is properly smoked you can then serve it as is with a simple set of condiments, such as bread, thinly sliced red onion, capers and lemon. Or, you can incorporate it into a variety of appetizer or main course recipes. First, make sure you have a quality smoker on hand. Next, choose your preferred wood chips--alder, hickory, apple, oak, or any kind of fruit or nut wood. Finally, prepare your salmon for smoking. First, note that the following instructions are for hot smoking, not cold smoking. Cold smoking is an intricate, lengthy process that requires specialty equipment and a lot of patience. Hot smoking is much more simple and produces results more quickly. First you must prepare a rub or a brine for the salmon. The curing process is essential prior to smoking because it eliminates some of the moisture inside the fish, and it infuses the flesh with salt, which helps to preserve the fish. 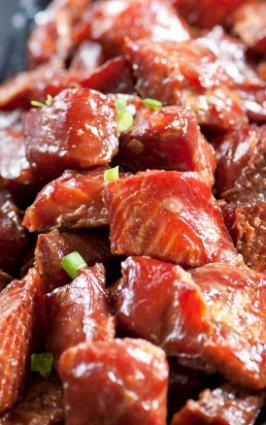 Below are a couple of different brine recipes that pair beautifully with salmon. In a medium bowl, mix together salt, sugar, brown sugar and peppercorns. Tear a piece of foil a little bit longer than the full length of the fish and top the foil with plastic wrap. Spread one-third of the rub onto the skin side of the salmon, turn over and spread one-third of the rub onto the flesh of the salmon. Place the second side of salmon flesh down onto the first side. Cover the skin with the remaining rub and fold the plastic over the fish to cover. Close the edges of the foil together and roll tightly around the fish. Place fish on a sheet pan and top with another sheet pan. Add canned goods or weights to the top pan and refrigerate for about 12 hours. Flip the fish over and refrigerate another 12 hours. Unwrap the fish and rinse off the rub with water. Pat the salmon dry with towels and place in a cool, dry place until the fish is dry, about one to three hours. Mix all ingredients together, add fish and put in a glass or plastic container. Refrigerate for 12 hours. Remove fillets from brine, wash off with cool water and pat dry with towels. Let the fillets dry in a dry, cool place (less than 65 degrees F) for at least 3 hours. After you have brined your fillets and chosen your preferred wood chips, it is time to smoke your fish. Basically, follow the directions on your smoker, and smoke the fish at around 200 degrees F or until the internal temperature of the salmon is 140 degrees F or when the fish flakes easily. Finally, remove the fish from your smoker and enjoy in a variety of ways. Since the fish is preserved with the brine, and through the smoking process, it will keep wrapped in the fridge for up to 10 days. It will also maintain its flavor in the freezer for up to six months.